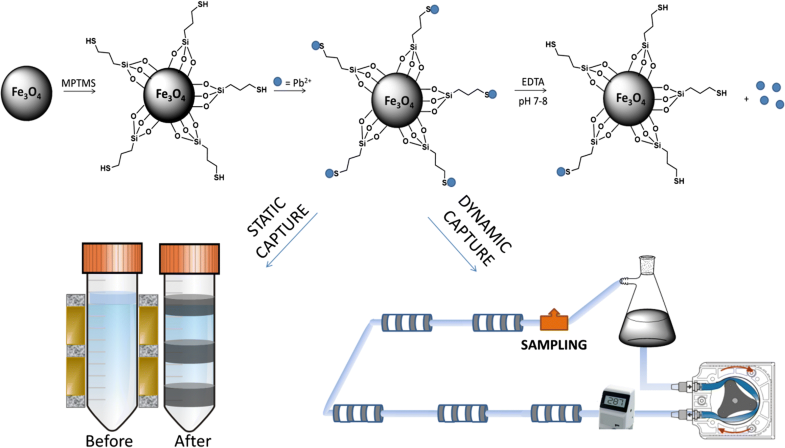 The synthesis of magnetite (Fe3O4) nanoparticles (NPs) and the functionalization by means of a silane derivative (3-mercaptopropyl) trimethoxysilane (MPTMS) as a way for heavy metal capture, i.e., Pb2+ ions, has been investigated. A direct reaction between the active thiol organosilane molecule and the surface of the magnetite nanoparticle is described. 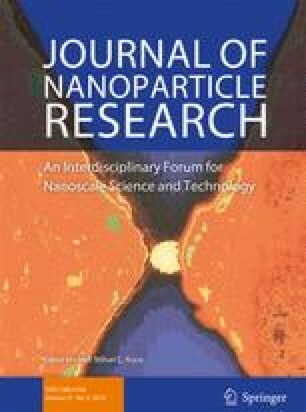 The coated nanoparticles, presenting an average diameter of about 20 nm, have been extensively characterized from the morphological, chemical, and physical point of view. The capture of Pb2+ ions from aqueous solution has been performed both in static and dynamic mode, using in both cases a configuration of commercial NdFeB permanent magnets. The amount of heavy metal captured by the magnetic NPs as a function of time, as well as its fraction recovered by an EDTA solution, have been measured by inductively coupled plasma atomic emission spectrometry (ICP-AES). The Pb2+ capture from a spiked water solution (5 mg/L) is very fast, reaching 91% in static conditions after only 10 min. Furthermore, dynamic data also demonstrated the possibility to apply the toxic heavy metal capture method to large volumes. One of the authors (F.C.) wish to thank the Italian Education, University and Research Ministry (MIUR), through the Research Project PRIN2011-NANOMED. This study was funded by Italian Education, University and Research Ministry (MIUR) through the Research Project PRIN2011-NANOMED (grant number 2010FPTBSH_005).